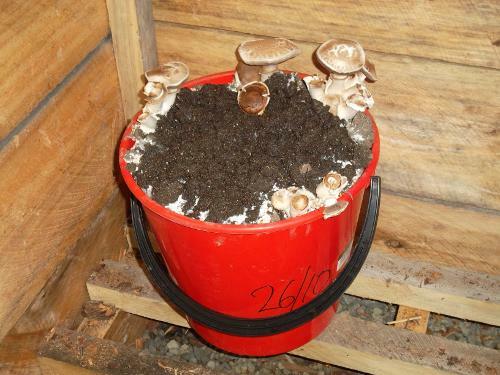 We recently bought a bucket of mushroom starter from local outfit, Parkvale mushrooms. It’s currently living in our firewood box outside the back door in the relative cool and dark. We’ve harvested over a kilo of mushrooms from it so far, and more keep coming up. At the current price of mushrooms it’s already paid for itself! Aside from the economy, the taste of just-picked mushrooms in our salads and on pizzas can’t be beaten. They’re easy to look after, don’t take up much space, and start producing immediately – ideal for the kitchen gardener.